NiMh, NiCd, Alkaline…. lithium. Stuff you need to know about batteries, chargers…. testing and using batteries. What’s it all mean and why should you care?! It’s important to select the right battery for your application but sometimes that can be confusing, especially for the average person who does not deal with this all the time. Good news is, it’s not that difficult when talking about NiCD and NiMH batteries. The 2.4v battery packs we are discussing here are all 2-cells, no matter what the chemistry is. Generally speaking, the more power the better! Your device will last longer doing the same stuff with a battery that can hold more amp-hours. As a battery ages it’s total capacity in mAh will diminish. Generally, these batteries are interchangeable… you can use NiMH battery in place of a NiCD and vice versa. NiCD is better at handling complete discharging and often used in solar lamps. NiMH is better at handling larger power storage (more mAh!). Most modern devices use NiMH or Lithium but we still see NiCD on rare occasions. These Uniden phones are one of those. I have no idea why. There is no advantage to the NiCD battery in this situation. It must have just been a cost issue at time of development. This voltage choice for a cordless phone presents an issue most people are not aware of. Many of the more advanced components used in these phones require 3.3v or even 5v just to operate. How does a 2.4v battery even work?? Well they use something called a voltage multiplier circuit to up the voltage. This requires more mAh to compensate…. draining the battery faster…. so a phone that uses a 3-cell 1200mAh battery pack will last longer than a phone that uses a 2.4v 1200mAh pack…. not because of the voltage but the fact that the 3-cell device will not need to multiply the voltage to operate 3.3v components. The Uniden DECT1580 phone original battery was a 2.4v 700mAh pack. 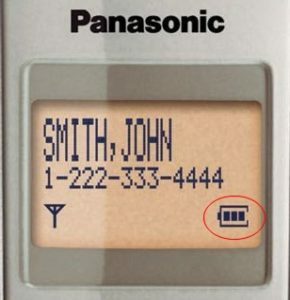 The Panasonic KX-TGA400b phone originally had a 2.4v 1500mAh pack. 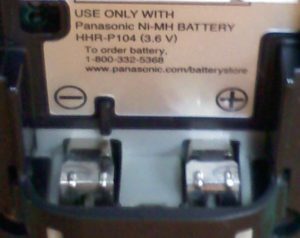 You can and should use the NiMH 1500mAh battery pack in the Uniden phone but you cannot use the 700mAh pack in the Panasonic phone. There are a lot of merchants advertising 700mAh batteries for the Panasonic phone, simply because the battery looks the same and has the same connector. Unfortunately this battery may appear to work, especially for the short term when new, but it will only cause problems in the Panasonic phone!! Buzzing over the talk path, poor quality audio transmit and no link to base errors are just a few of the most common problems weak batteries cause in the Panasonic phones.